Requirement to reduce blood pressure over hours (hi BP is causing end organ damage) rather than weeks. Remember that illicit drugs particularly cocaine may cause acute hypertension. Ca++ antagonists. Beware heart failure (clinical overload). Beware Hypovolaemia. GP should confirm (> 140/90 mmHg) on at least two visits. Routine ambulatory blood pressure monitoring is of unproven value. Please ask GP to formally assess cardiovascular risk ± refer to OPD. Formally assess their cardiovascular risk. Accelerated (malignant) hypertension and suspected phaeochromocytoma require immediate referral. 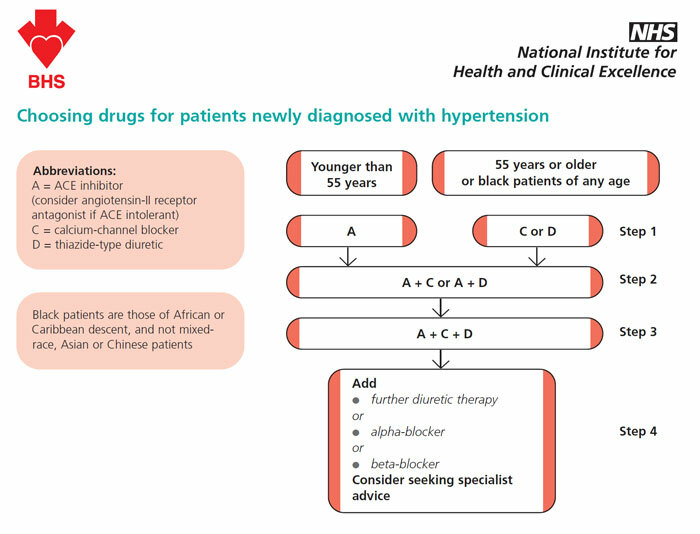 An angiotensin-converting enzyme (ACE) inhibitor (or an angiotensin-II receptor antagonist if an ACE inhibitor is not tolerated). Content by Dr Íomhar O' Sullivan 12/12/2005. Reviewed by Dr ÍOS 24/04/2007. Last review Dr ÍOS 3/12/18.